Despite being a small place, The Netherlands has always been a country with global influence. Most of this stems from the golden age in the 17th century where the world was in awe of Dutch trade, science, military, and art. This legacy of entrepreneurial and global spirit seems to be ingrained in Dutch culture and its something that I found to be true when I met with the team at the 1% Club a few months ago. They are an organisation trying to make a real impact by aiming to improve the standard of living globally. To do this they connect development projects with people, money and knowledge around the world through their website. What makes 1% Club unique is that they have a very transparent process. You get updates and information about how your contribution is actually making a difference to the project you care about. 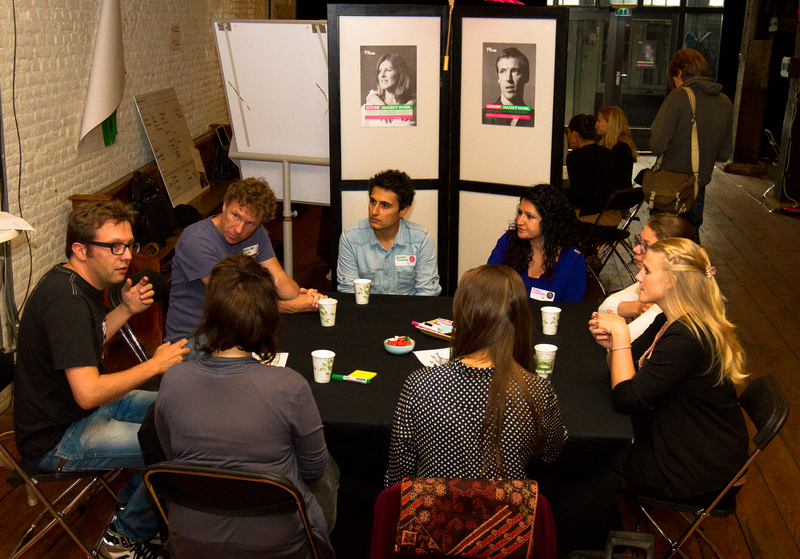 Every year they host three Co-Creation Labs with around 40 professionals from different backgrounds to help people who have great ideas on how to improve the world but are not sure how to make them a reality. As part of the planning for this years co-creation labs, Frog (the company I work at) and the 1% Club team explored ways in which the co-creation sessions could be improved. The main problems to solve were primarily around the structure of the sessions, how to keep the momentum of ideas flowing and then ultimately documenting and presenting the solutions in a compelling way. In June I attended my first co-creation lab where we got to see whether or not the new tools and techniques would make a difference to how the groups generated, captured and delivered their ideas. To kick off the afternoon we were introduced to four cases: Changing Communities in Kenya, Give Girls a Chance to Excel in Cameroon, Simple Village Community Cinemas in Kenya, and One Cushion, One Life in Zimbabwe, which is the project my group decided to take on. One Cushion, One Life is initiative by the Uhambo Foundation which is an organisation that aims to ensure that 30 wheelchair users in the region of Bulawayo, Zimbabwe will have access to cushions that are designed specifically for their physical condition. Because of their bespoke design the cushions help to prevent further conditions developing and therefore improving the quality of life for the user. The challenge for us was to come up with ideas for how wheelchair users in Bulawayo could be self sufficient, make money and contribute to the cost of purchasing and maintaining the cushion. This is important in an country like Zimbabwe where a disabled person is often seen as a burden on their family. The group getting ready to develop ideas for the One Cushion, One Life project. Despite the chaos and a tight timeframe we managed to develop a variety of ideas. Throughout our process we were lucky enough to have the case owner with us so we could share our work in progress. This was fairly unusual as most of the time the case owners are in a different country which often poses various challenges (one group had to contend with a traffic jam in Nairobi for example). Philomeen Engels the case owner for One Cushion, One Life. We ended up with three ideas that we felt could be viable solutions to the challenge. Our main focus here was to think of ways in which we could bring the material cost of the cushion down through recycling. We focused on industries where there is potentially a lot of waste foam such as airlines (where do all those seats go when they fit new ones?). This idea focused on how the use of online platforms could be used to sell local produce, skills, knowledge or crafts such as helping the local community set up a dried tomatoes and onion industry or upcycling business. One of my favourite ideas was to think about the how the wheelchair itself could be used a tool to generate income. For example using the wheelchair to generate power for mobile phones or lights. Another idea was to create a service for moving goods from one village to another using a trailer attached to the wheelchair. A wall of ideas and possible solutions. Overall it was a fun 6 hours. I got to know some new people from really diverse backgrounds and think about a creative problem that is completely outside of my normal day-to-day work. It’s tricky to develop ideas for people who live in an environment that is completely a world apart from your own. I’ve never been to Zimbabwe and I don’t know the difficulties wheelchair users face there, so it was difficult to judge whether or not our ideas would be received well or could make a difference. However after receiving feedback from the team at the Uhambo Foundation we found that the ideas have provided them with an opportunity to explore new ways to source foam for their cushions and the idea of providing a service using wheelchairs has actually gained some momentum in the local community. The One Cushion, One Life project can viewed on the 1% CLub website and finally here’s a video that gives a flavour of the overall event (most of it is in Dutch).